what kind of premix should i use with e85 and to what mixture? i'm using amsoil 1oz per gal. In for more info. I've seen this discussed a number of times but I haven't been able to weed out any definitive answer. One aspect I'm unclear about is fuel-premix ratio vs total premix volume. Because e85 requires about 30% more fuel per injection event, that much more pre-mix would be injected per combustion event. It would initially seem that the pre-mix could be reduced according to maintain the same volume per combustion cycle. 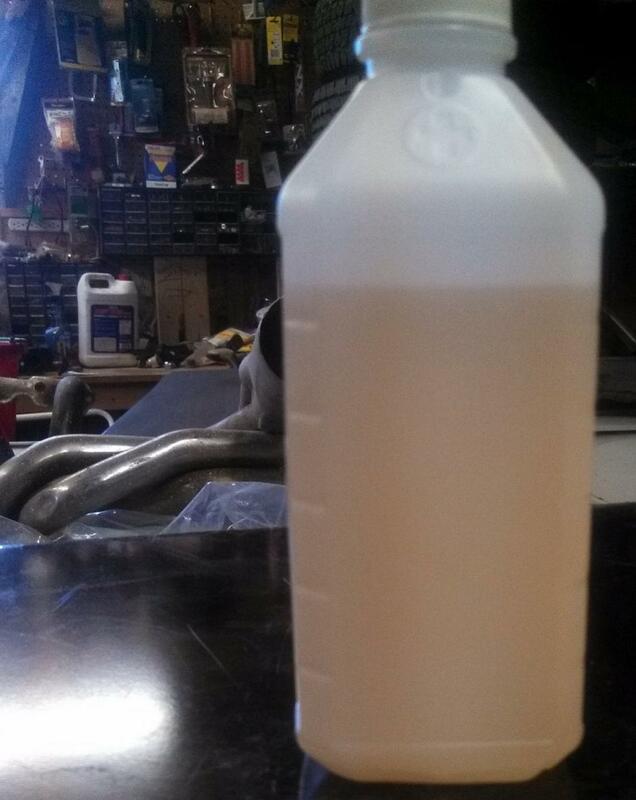 I LOVE that the Redline and Silkolene oils mix so well in the E-85, gets me over the original concerns I had over premixing that the 2-cycle oil would not mix well in the tank or seperate out. 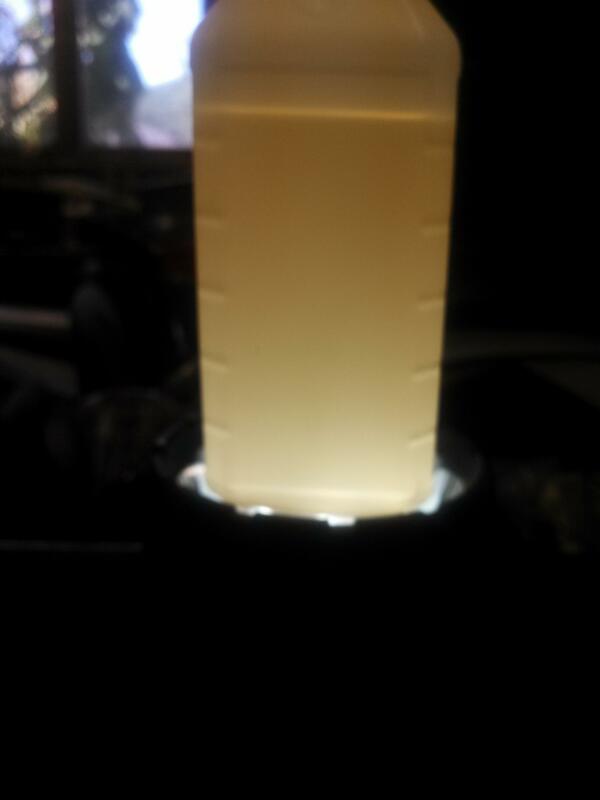 I had concerns about Benol seperating, so I mixed some with E85 in a clear plastic can and shook it up. It stayed suspendended as long as I let it sit. It is made specifically for alcohol, so that is what I will use from here on out. I did mix E85 with some of the Pettit premix oil in a clear plastic container and it has separated yet, it's being over 2 weeks already. Also has anyone ever tried K-100? I've been trying to figure out what oil to use and I know to look for ethanol compatible but will any castor work? Also, what about just synthetic 2 stroke? Just trying to figure out a cheaper alternative to the Benol and Maxima stuff. Rxtasy57, not really. What info about synthetics? I've been reading up elsewhere and it seems ester based ones, instead of petroleum based, would probably mix well, but has there been anybody that uses that? I've also read a lot of info that says B100 Biodiesel would work as well, but again any testing? I don't have any B100 around me but I've got a trucker buddy so I may try this someday myself. I figure ~$4/gallon, depending on where you get it, is a hell of a lot cheaper than $40+ for all this castor crap. Who said anything about synthetics? Read the original post. Here is the in depth info posted about premix right here on this forum. I had asked about synthetics, and you had said it was all here. And, everybody seems to stay to just a couple options and I was just trying to figure out something else. I've been trying to read up about this and have learned a lot about polar and non-polar liquids, and how they mix. If I had some B100 around here I'd test myself, but I don't so I'll throw this up to somebody who can get some and see. Just got a hold of about a gallon of B100, so I'll try testing this here soon whenever I get another spare gas can. What kind of clear containers should I be using, glass/plastic, closeable/not? I'm going to try and test the blends of ethanol I can get around here, E10, E15, E40, and E85 with both SuperTech (Walmart brand) and the B100 to determine what the limit would be on ST and if, in fact, the B100 works on any of those. Mainly going to be looking at E85/B100. 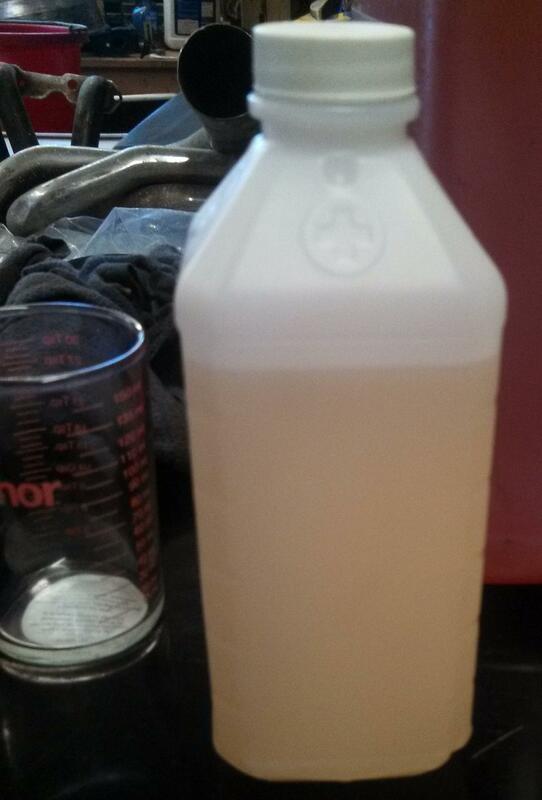 So, I grabbed a gallon of E85 and found an ~470ml bottle of rubbing alcohol, #2 HDPE so fuel resistant, and added about 384ml of E85 and 15ml of B100, about 24:1 ratio, and shook the heck out of it to make sure it mixed well. This is after sitting for about 16 hours. It may be a little hard to tell through the opaque bottle but I used the flashlight app on my phone underneath the bottle and couldn't see any separation. Well, here's an update after 3 days. Still no separation that I can see in the first picture, the second is with a light under the bottle to check and I can't see anything. I'll give it a go later today when I fill up. Well, I've been running the B100/E85 since my last post, 18 days ago, I've been through multiple tankfuls and no issues yet. I'm mixing at 1oz/gal and she doesn't/hasn't acted any differently, though I'm still working on my tune. Well, it's starting to get cold around here, the B100 is starting to cloud up a bit but hasn't quite started gelling up yet. So far though, no issues, but won't know until it gets really cold. Just another update. Still running E85/B100. Only issue so far, and has nothing to do with the mix or engine/car, is that if I leave the jug of B100 in the car it does gel up on the really cold days, but I just leave the jug in the house until the days I plan on filling up. Other than that it's been almost 5 months on this stuff without an issue. Great thing is, the B100 around here is only $3/gallon, compared to $12/gallon for SuperTech TC-W3 and $40+/gallon for castor. Im curious, have you inspected any of your fuel system components? Do you monitor fuel pressure? Introducing something with an unstable viscosity to my fuel system just doesn't sit well. Aside from that, Im curious if the stuff is doing its job in lubricating the motor. Haven't inspected really except what I've seen through pulling my rails about a hundred times a few months ago chasing some electrical problems, but I don't remember what the insides look like. I do remember the injectors being quite clean though, although I did send them off sometime last year so it could be that. When I rip back into everything to gut unnecessary stuff I'll try to remember to check and take pics. Also, I don't actively monitor pressure but I am running an aeromotive a1000-6 with an analog gauge hanging off it and pressure at idle with and without vac ref and free revving are correct. Don't have the change for a digital gauge, but I do eventually want one so I can log it on my ms3x during runs. What viscosity would you be referring to that is unstable? I do plan on tearing down for a rebuild/high comp turbo build here hopefully soon, again waiting on all those coins I keep finding in the cushions to add up.